This page will demonstrate how to send and receive data from the ADR112 or any other ADR interface, using Linux gcc programmes. It shows the commands used to configure the serial port, send data out through the serial port, and receive data through the serial port. Additional help is available from the Linux HowTo documents found at a variety of locations around the web (hint: use a search engine). The man pages of your Linux system are invaluable as well. I make no effort to explain all of the parameters used in the various API calls. Read The Famous Manual. I tested this program using Redhat 7.3, however I believe this code will operate correctly under all recent Linux kernels (your mileage may vary). The code was compiled with version 2.96-110 of the gcc compiler. Any recent vintage of the gcc compiler should be fine. There are four files needed to compile the Linux example. // whatever manner you desire without restriction. // WARNING: Example only. Lacks error checking! Ontrak will send you a tarred and gzipped version of the above files (see bottom of this page), but it includes nothing beyond what is listed above. To compile type "make" at the shell prompt. First off, you have to grant permission to access the serial port. On my system I logged in with root authority and used chmod to grant all users read/write access to the serial port. Type "./adrserial 0" at the shell prompt to run the example. Type in a command for the ADR card and press enter. The command is written to the port and any response is displayed. Type "q" to shut down the adrserial programme. Here is the ADR112 card that I used to test this programme. There are several things to notice in the picture. The LEDs are wired to PortA of the ADR112 card. 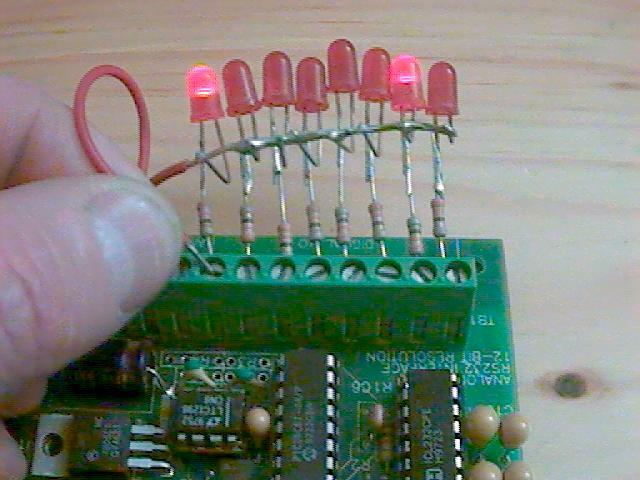 There are 8 LEDs, one for each of PA0 through PA7. Current limiting resistors protect the LEDs from burnout. 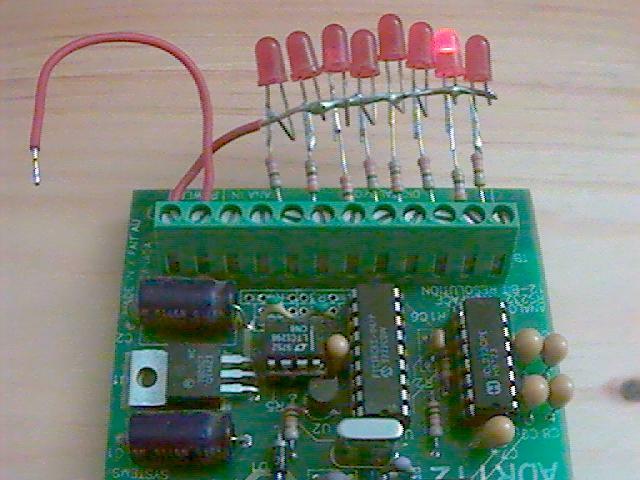 The loose red wire is attached to the +5V supply. It allows me to pull an I/O line high during testing. Here is a screen-shot of the adrserial programme starting up. followed by a number of lines of debug information. The ? : is a prompt to enter a command for the ADR112. Here is a screen-shot of 2 ADR commands. The first command, cpa00000000, sets PortA into output mode. The second command, ma2, turns on the PA1 I/O line of the ADR card. After these two commands the LED connected to PA1 is lit up. The rpa command instructs the ADR card to report the status of all 8 lines on PortA. The above screen-shot shows that PA1 is high (on) and all other PortA lines are low (off). Prior to the next command I used the red wire to feed +5 volts to PA7. This caused the LED on PA7 to light up. Notice how both the LEDs on PA7 and PA1 are lit up. PA1 was turned on by the earlier ma2 command and PA7 is lit up by the current flowing in the red jumper wire. An rpa command was sent to the ADR card eliciting the following response. This shows the ADR card reporting that line PA1 and line PA7 are high (on). All other lines on PortA are low (off). Specifying the wrong port number. In Linux the ports are numbered from 0 unlike Windows where port numbering begins at 1. Using the right port number but the wrong connector. Ensure that the cable is connected to the right DB9 connector on the back of the PC. Using malformed ADR commands.The ADR card will silently fail to honour malformed commands. Thus a cpa command must be followed by exactly 8 digits plus a carriage return. If a digit is left out then the command is ignored. Ditto for the ma command if the decimal value is larger than 255. 1 means input, 0 means output.If the port is configured incorrectly then unexpected results occur. Microchip suggests a memory aid: 1 is like an I for Input and 0 is like an O for Output. Error Codes.The programme bails on any unexpected condition. Fortunately it displays an error code for each failure. Check your local man pages for the failing API to determine the cause of failure. Of course your application will have to deal with problems in a way appropriate to your environment. Ideally a production programme should never bail but should gracefully handle errors. Compiler Warning. The gcc compiler emits a warning "the gets function is dangerous and should not be used." This warning is expected and OK for a tutorial sample. Your application will have its own mechanism for invoking commands. Read Error: EAGAIN. 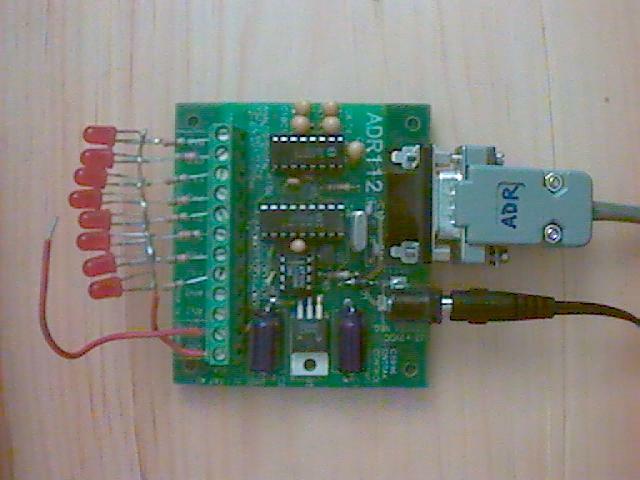 For the sake of simplicity the adrserial demo does not try to differentiate between commands that evoke a response from the ADR card and those that do not. The demo simply tries to read a response after every write. If no response is forthcoming then the EAGAIN errno is generated by the library routines. It is best if your application avoids reading after writing a command to which there is no response. The remainder of this page contains some additional details that you may skip at your discretion. Some of this is directed at Linux newbies. Do not call Ontrak and for help about this example. It is provided as a courtesy to show the operation of an ADR card in the Linux environment. It is not supported. All the screen-shots show an xterm session running on a Gnome desktop. The caption bar shows the userid, jhomppi, and the machine name, guardian. (This machine normally operates as an Internet firewall.... hence guardian is its name). The programme can be run from a normal tty console session (ie. command line). You do not need to start an xterm. You do not need to start the x-window environment. When you have a numeric error code you will find that all of the man pages refer to #defined constants (eg EAGAIN). The /usr/include header files help you translate an error number into its constant. On our development system (Redhat Linux 7.3) the file /usr/include/asm/errno.h contains a long list of defined error constants. Looking up the EAGAIN constant shows a value of 11. This example is based on information gleaned from many Internet Web sites. Special accolades go to the following. Thanks to all of the Linux and gcc developers, documenters and testers. Thanks to Michael R. Sweet for his "Serial Port Programming Guide". Thanks to Luis F. Guzman for explaining the "find" command on the Central Indiana Linux Users Group page. Thanks to Redhat for providing free ftp distribution of Linux. This programme is free. Free of cost. Free of restrictions. You can use it, copy it, modify it, distribute it and include it in your own application programme. This programme is also free of any warranty, express or implied, for fitness or merchantability. Use at your own risk. I hope this assists your programming efforts. To retrieve the Linux files used in this example (200K ) in ZIP format, click "LINUX EXAMPLE"